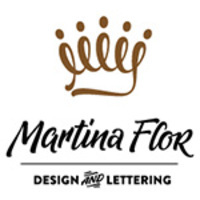 Martina Flor combines her talents as both a designer and an illustrator in the drawing of letters. She grew up in Buenos Aires and gained a Master in Type & Media in The Netherlands. Based now in Berlin, she works with a focus on type and lettering for clients all over the world. She published her first typeface Supernova, a family of Scripts, in 2013 at Typotheque and her work as designer and letterer has been featured in many publications and she teaches and lectures extensively.